Complete online surveys and earn Opinion Points which can be redeemed for PayPal CASH! 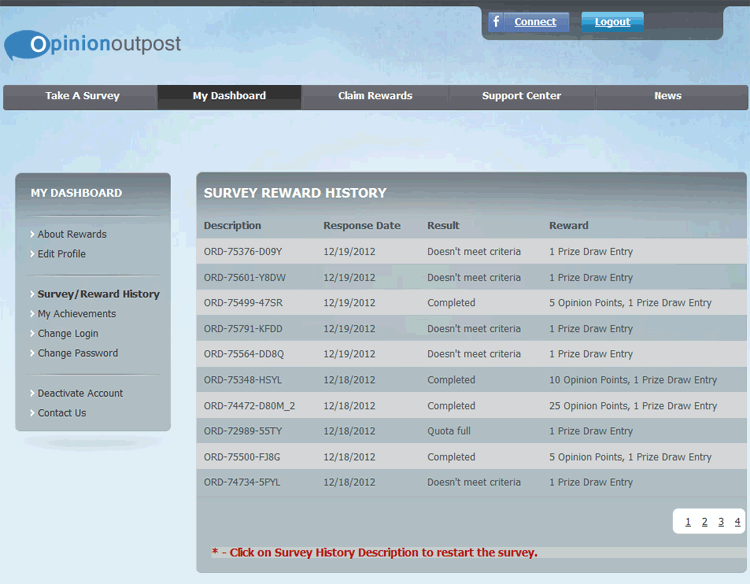 For most online surveys you complete with Opinion Outpost, they will award you with a certain number of Opinion Points. The number of points you will be awarded will be specified in the survey invitation e-mail. For short surveys, 5 points are awarded (50 cents), and for longer surveys, 25 points or more ($2.50 and up) is given. Simply accumulate 100 Opinion Points in your account, and you can request a payment for $10.00 paid to your PayPal account. Most payments are made within 48 hours and in US dollars, not Canadian dollars. With only 50 Opinion Points (or, $5.00 worth), you can request an Amazon gift voucher. The voucher code will be emailed to you shortly after requesting it. Every quarter, a cash draw is held for $1,250 for a total of $5,000 yearly. Entries are awarded when you try to take a survey but are disqualified. Draws are held exclusively for Canadian members of Opinion Outpost. Helpful Tip! Don’t wait for emails from Opinion Outpost to complete surveys – simply log into your account and click on “Take a Survey”. You will find you complete many, many more studies this way. Opinion Outpost is an online survey panel owned and operated by Survey Sampling International. Founded in 1977, Survey Sampling offers market research solutions all around the world. To get started with is simple: simply complete the registration form, confirm your registration by clicking on the link in the confirmation e-mail Opinion Outpost will send you, and from here on in they will contact you via e-mail every time an online survey is available for you to complete. The survey invitation e-mail will tell you the topic of the survey, approximately how long it will take you to complete as well as what your reward will be for participating in the survey.